Fun, effective, and you may already have the ‘ingredients’ in the house – the chief ingredient being children with lots of puff! Paper – good quality not essential, but looks nicer framed. Water based paints – watered down. 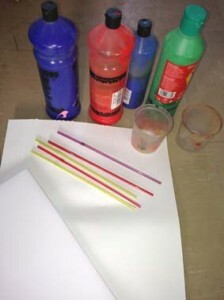 Drinking straws – one per child (skinny drinking straws are hard work, best to use fatter ones). Firstly, protect your work surfaces, this can get messy! You could protect the children’s clothes too, since they might prefer blowing paint at each other instead of the paper! Next, choose your colours. Greens and browns will obviously look more natural, black would look dramatic, but really any colour will do. 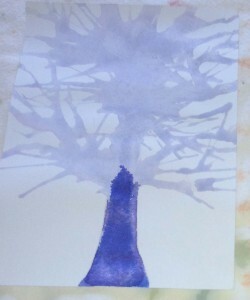 You could get really creative, and use a coloured paper background, say dark blue, with a silver paint to make a tree skeleton kissed by moonlight. Then the fun begins. START BLOWING. Blow in one direction, and follow the trail of paint out to the edge of the paper. 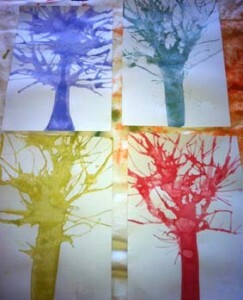 Then go back to the trunk, top it up if necessary with watery paint, and start blowing again to make a second branch. Gradually build up your branches, your choice how they go – experiment. Short fast puffs make a splatter effect, like tiny branches spreading off a pollarded stump. Longer puffs make longer branches, but the random nature is what makes the magic. And when you’ve finished, leave to dry thoroughly. They look stunning on their own. Each of them totally unique – just like the real thing. Since I discovered Pinterest, I’ve also discovered some great sites using skeleton tree art. Check them out – they’re fantastic! that artist woman – lots of great art projects by Gail Bartel, the skeleton tree art features a beautiful sunset coloured background – stunning! 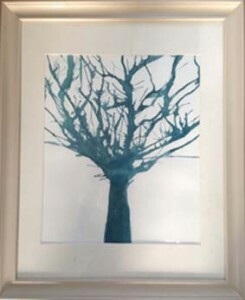 This entry was posted in children, Family life, how to make, Where I talk about stuff and tagged art with the children, Crafts for children, how to make, Making Mondays, making things, skeleton tree art by Trudy K Taylor. Bookmark the permalink. I’m going to try this with my daughters, who love straws. Thanks for the great idea!